Edison Pen Co – Italic Nibs Are Here, and LE Reminder! I’m very happy to announce that our 1.1mm and 1.5mnm Italic nibs are finally here! These are steel nibs, and are available in the #6 size. 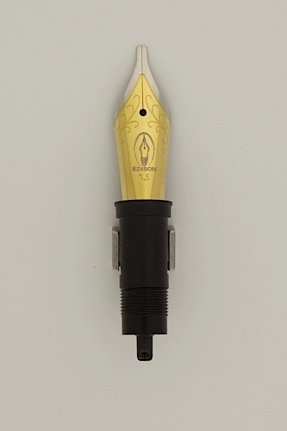 So this makes the Edison Nib offerings…. Steel #6 – XF, F, M, B, 1.1, 1.5. For reference, the #6 nibs fit all of the standard sized pens. The #5 nibs fit the smaller pens such as the Pearlette, Mina, and Encore. 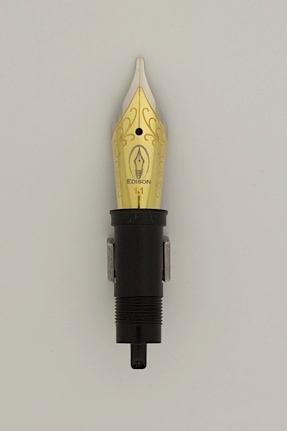 These new italic nibs will be available on all Edison Pens. This includes the Production Line, so you will see these #6 italic nibs being offered from our retailers as well. These nibs can be purchased separately and be placed in current Edison Pens. Cost is $25. Email me to inquire. And remember that these new italic nibs are available on the 2013 Limited Edition Morgan. The buying period for this pen ends on April 7th, so if you missed out on last years LE, now is your chance! Click here for details.